The National Aeronautics and Space Administration (NASA) Science Mission Directorate (SMD) and Human Exploration and Operations Mission Directorate (HEOMD) have released the third Solar System Exploration Research Virtual Institute (SSERVI) Cooperative Agreement Notice (CAN) as NNH18ZDA018C. NASA invites the submission of multi-institutional team-based proposals for research as participating members of the Solar System Exploration Research Virtual Institute (SSERVI). Proposals must clearly articulate an innovative research program addressing basicand/or applied research fundamental to understanding the nature of the Moon, Near Earth Asteroids (NEAs), the Martian moons Phobos and Deimos, and the near space environments of these bodies, to enable eventual human exploration of these destinations. Proposal review, selection and award will be implemented according to the guidelines set forth in Sections 5.0 and 6.0 of this funding announcement. While SSERVI will continue to support research addressing potential human exploration destinations, given 1) the Administration’s focus on returning to the Moon and 2) opportunities to be provided by the commercial lunar industry, proposals that address these near-term lunar needs and opportunities will be given preference. Proposed research that complements current CAN-2 Institute Teams, and/or addresses important research areas not currently covered in the Institute, will be given strong consideration (see: sservi.nasa.gov/sserviteams). A mandatory “Step-1 proposal” is due 11:59 p.m. Eastern Time October 19, 2018. See Section 4.2.1 for details regarding how a Step-1 proposal differs from an NOI. Step-2 Full proposals are Due: 11:59 PM Eastern Time on December 18, 2018. Email questions no later than 14 calendar days prior to the Step-2 proposal due date to: HQ-SSERVI@mail.nasa.gov. Anonymity of those who submit questions will be preserved. Responses to questions and the full text for this CAN may be downloaded directly from the NNH18ZDA018C page on NSPIRES or be may reached by searching on NNH18ZDA018C at solicitation.nasaprs.com/open. 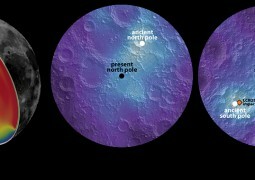 Ancient lunar ice indicates the moon’s axis slowly shifted by ~125 miles, or ~6 degrees, over ~1 billion years.